In my hunt for Print collectibles I have never stumbled across a better example for children of the printing process. 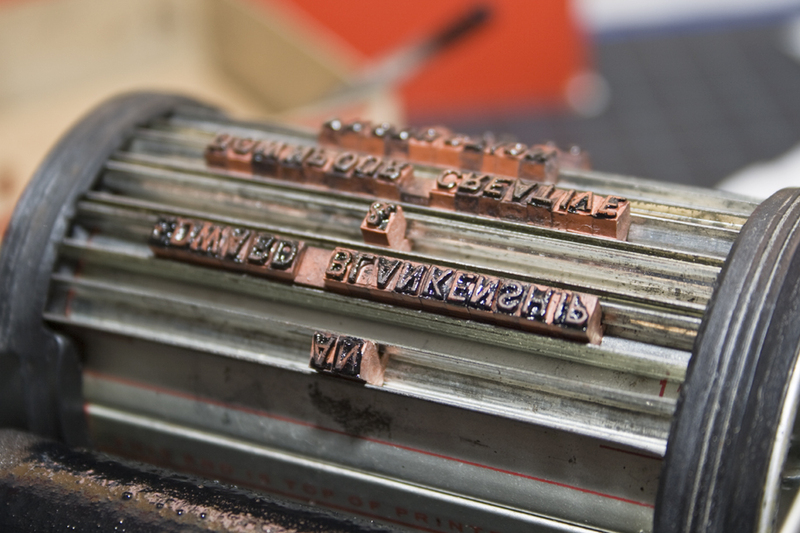 This “Toy” gives a child a first hand attempt at setting type through the letterpress printing process. I found my first Cub Rotary Printing Press at an antique store, but it was VERY incomplete. Just an impression cylinder and a shell – nothing more. This did spark my interest and I took to EBay to find the full thing. Currently I own three and am trying to combine all to create one complete set. The Superior Marking Equipment Company (SMECO) was an American manufacturer of rubber type and rotary presses marketed as children’s toys. Kits like this one were sold between the 20’s and 60’s. This particular kit includes the Cub printing press, the smallest of three rotary press models, and prints sheets up to 3.5” x 5.5”. The Star and Ace models print 3.5” x 7” and 5.5” x 7.5”, respectively. as well as an ink roller and all the tools you would need to remove rollers and clean/ink them. This is truly just the perfect present for that print geek in your life. Or a great addition to any home print collection. Happy Monday Printheads! Stay tuned this week – as all week we will be bringing you great “toy” examples of the printing process! Run out of E’s! Too funny Richard! Thank you for sharing. I know nothing about this “toy” but I have a ‘print your own newspaper’ set and I’m trying to figure out more about it. I don’t think it’s a whole set. But I have the two original bottles of ink, the letters, some metal rod things to put the letters in too. It had the tweezers and some metal hook things. It does have an instruction manual. On the side of the box it says “supplies for the cub” so I’m just assuming it’s a set of supplies. I have no idea of how old it is or what to even do with the set for that matter and now I’m just doing research on it.